In the Netherlands, the traditional greenhouse vegetable season has started well. Crops grown under lighting and organic ones are expanding, putting prices under pressure. This applies in particular to on the vine tomatoes. These tomatoes were already in a difficult situation anyway last winter. The prices for the crops grown under lighting were “dramatically poor” in February, and it was important to get the winter production out of the way before the crops grown without lighting came on the market. The virus, which, according to the growers there, ended up in Israeli horticulture through Dutch seeds, has been spread further through soil machines. Israeli growers told us that because the soil in which cultivation takes place ensures continuous recontamination, they’ll have to wait for resistant varieties. Regular meetings are held in Mexico and Italy to promote the importance of hygiene in the cultivation process. “Prevention is the best defense” is the motto, and everything is put in place to make the sector act accordingly. The virus has also been found in the Netherlands, but otherwise there is still a great deal of uncertainty. Officially, the authorities have not confirmed any ToBRFV detections, although no official statement is necessary, because it has no quarantine status. Information on hygiene protocols has still been spread, also among pepper growers, for whom the virus is also a threat. Meanwhile, the NVWA doesn’t know whether eradication of the virus is possible, because it is a virus that spreads easily through contact. Growers can currently only hope that they do not get infected and must try to protect themselves as efficiently as possible. Given that the Moroccan tomato season is also slowly coming to an end, prices are rising across the board. “We were unable to foresee this; otherwise, we would have stored more goods.” In the German trade, Moroccan vegetables are increasingly seen as a cheap alternative to Spanish products. “The days when the Moroccan product left much to be desired in terms of quality are now far behind us,” said the trader. As soon as Morocco ends, the tomatoes are imported from Spain or the Netherlands. “We have also received offers from Egypt,” confirms the importer. Larger volumes of German tomatoes are also expected within a few weeks. These will also be traded from the Hamburg region by then. French growers are at the start of the season. The prices are slightly lower than last year’s, but are still satisfactory, according to a trader. The yield obtained from the harvest varies greatly per company. The prospect is that more and more specialty products will enter the French market. After last year’s bad prices for on the vine tomatoes, many growers are now entering this segment. The demand for these varieties is high. According to a grower, every person in France knows at least one specialty nowadays. Another important trend on the French tomato market is the demand for pesticide-free tomatoes. The poor reputation of greenhouse tomatoes in terms of taste remains a challenge for the growers. “The balance between supply and demand has remained fairly stable in recent weeks. Prices are around average, although this varies per product. There is already oversupply in the foreign market. 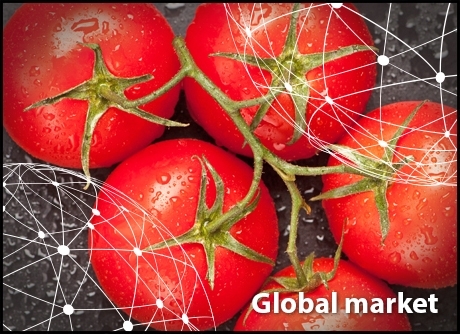 In the Netherlands, for example, prices are under considerable pressure,” says the tomato expert. Prices are high, R15 (0.95 euros) – R18 (1.14 euros) per kilogram in the north of the country, slightly lower in the Cape where volumes are better. Statistics NZ reports that the retail price of tomatoes in March 2019 increased to an average of NZ $ 5.20 per kilo. This is 44% higher than in February. The sector’s total value is $ 131 million per year, including $ 12.24 million worth of exports. Australia and Japan are the most important destinations. According to TomatoesNZ, there are no known cases of the ToBRFV virus in Australia and New Zealand, although the sector is keeping a close eye on the situation. The virus is considered a new threat that is spreading rapidly across the various continents. New Zealand growers are requested to report any unknown plant symptoms to the MPI exotic pest and disease hotline (0800 80 99 66). North America is switching from winter cultivation to spring cultivation. The supply looks promising. “In South Florida, open ground tomatoes are still available. The harvest of spring tomatoes is starting sometime in the next ten days. This season is only short and runs until June,” says a trader. At the same time, regions such as Nogalez, Arizona, are at the end of the campaign. The Mexican production continues. “The supply from Mexico is good, but not overwhelming. There are limited volumes of Roma and round tomatoes,” says the trader. The Mexican greenhouse tomato season will probably last until mid-May at the latest. Meanwhile, the domestic cultivation is growing. “The harvest continues all year round, so as the days get longer, the volumes go up,” says a grower.